Natural whitening shampoo with chamomile. 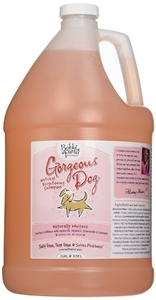 Gentle and natural, Bobbi Panter Gorgeous Dog Shampoo contains jojoba oil and Vitamin E to enhance skins and coats. Leaves dogs with a fresh, peachy fragrance. Dilutes 20:1. This natural, sweet-smelling shampoo enriches skins and coats while leaving a slight peach fragrance that lasts for weeks. Gorgeous Dog Shampoo will have pets looking red-carpet ready all the year round.